Feel the luxury flowing from Nature in this series with black caviar! Its noble variety is a real cocktail of beneficial ingredients from the depths of the sea used specially for your hair. Treat your hair to a luxurious bath with Hello Nature! 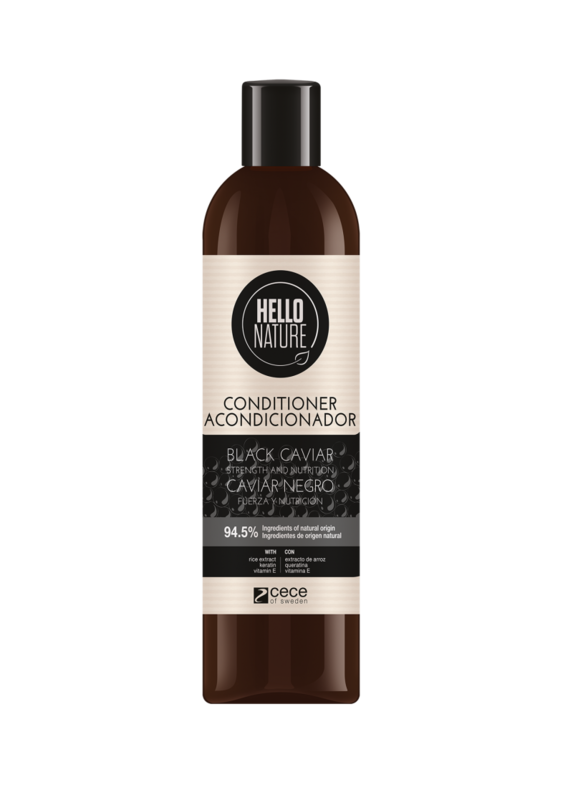 nourishes and gently cleanses the hair and scalp. It provides intense care, repairs damage and gives the hair a healthy shine. Capacity 300 ml. 87,5 % of the ingredients are of natural origin. Directions for use: Apply a small amount to wet hair, massage gently into a lather, rinse. Repeat and enjoy luxurious care! intense regeneration and hair hydration. It helps to repair damage and gives the hair a healthy shine. 94,5 % of the ingredients are of natural origin. Directions for use: Apply a small amount to wet hair after shampooing, avoid direct application to the scalp. Leave for 2-3 minutes, rinse thoroughly and enjoy luxurious care!